Pulled post on the Palm Pre? 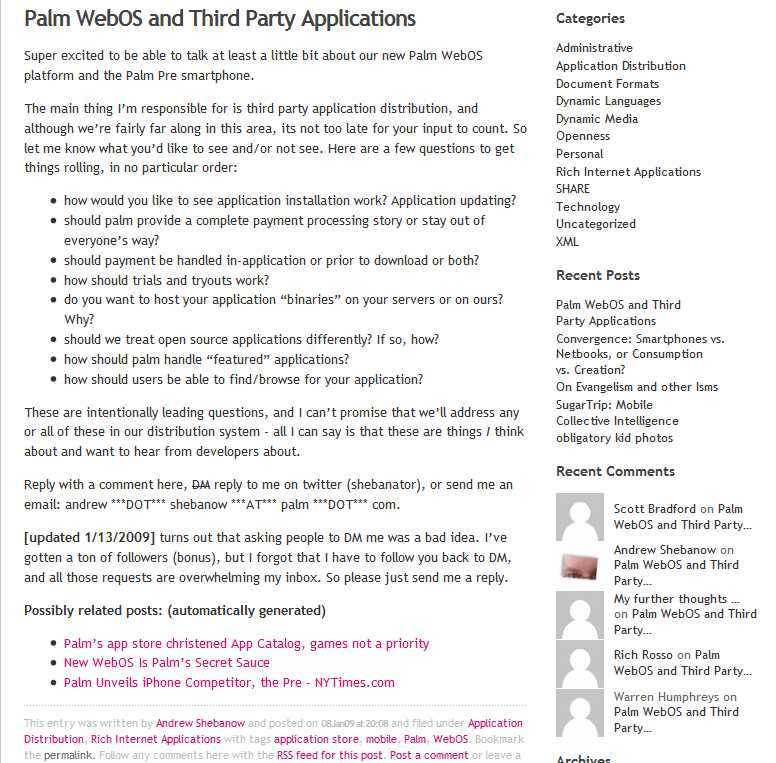 Earlier today Andrew Shebanow, a developer with Palm, posted an intriguing set of questions for potential developers. 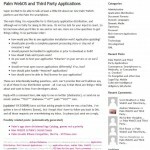 How would they prefer their applications to be distributed on the Pre platform? A popular and influential Mac Blogger, John Gruber of Daring Fireball, linked to this post and caused the usual huge influx of traffic. Unfortunately this was apparently more than Andrew and his bosses had bargained for. As of now the post has been removed. I think it was reasonably (though maybe not perfectly) clear from the original post that this was a developer being allowed to have his own voice rather than speaking for the company. It also was a refreshing break from Apple’s absolute control over messaging (even if that control was considered partly responsible for their success now). It was even more refreshing since this topic, app distribution and control, is the sorest subject for Apple devotees right now. Here is a chance to capitalize on Apple’s mistakes, Palm. Think carefully, but think quickly. Don’t let this opportunity get away. Viral Marketing: Billboards gone … nowhere? Strange billboards and another attempt at good-ol viral marketing: Why do I care? Because when you enter into the murky world of viral marketing, guerilla marketing, you need to realize one thing: You lose control of the message. It will become whatever it will become, but it is not under your control any longer. I’m not suggesting it’s a bad thing to do, but you better know you’re playing with fire when you do it, and it’s a good idea to be as prepared as you can. When bloggers talk about Transparency, they aren’t just spilling ink. Things have changed, so don’t go into this with your eyes anything less than wide wide open. Follow the link if you want to know (sort of) what it means. Otherwise, feel free to speculate here about The Algorithm. I’d suggest that the algorithms not only need more work, but that they aren’t the only answer. So . .. yeah. Kind of overdue for an update around here. This is just a quick note to let you know that I haven’t disappeared or been eaten by a giant purple monster or anything like that. Updates are coming . . . sometime. It’s holiday season, though, so don’t expect a return to daily updates for a while. Quick weblink of the day: new dream vacation location (here’s a video from Plitvicka Jezera National Park in Croatia) – and yes, I would like that print for Christmas! Well, that was an interesting week. I don’t know about you, but I am SOOOO GLAD the three-day weekend is finally here. Sorry non-U.S. readers, but then again you get a ton more holidays than us anyways. Wednesday was an interesting change of plans, and Thursday I went to Utah, fixed a system, and came back. Let’s just say it was a long day. Thankfully it was a very successful trip. Between Wed and Friday I probably spent upwards of 12 hours on the phone for business – that’s in addition to the flights to Utah and back (4 hours each) and several hours at a customer’s site. So if I talked to you, and was a little short, sorry about that. Now the question is “What to do with 3 days? !” I’ve got a lot of things that need done around the house, and several things I’d like to work on with my website, not to mention a family that definitely needs some attention. Plus it seems like it’s been awhile since I’ve had this much time to do stuff besides work. Anyways, pictures coming soon. Have a good holiday weekend, or if you’re working Monday, well, I won’t be. Vkaryl came to my rescue again and fixed the navigation issue on single post pages, which was due to a few missing styles in the stylesheet. extra images (not related to the theme currently) were removed. sidebar has been added to single post pages. I’m really happy to have a widgetized Rubric theme. There’s a lot of work to be done to get my blog set up exactly how I want it, but that’s part of the fun too (at least for a geek like me). What do you think? Do you like it? Is it too complicated? What information do you want easily available on the front page. I’m all ears. Sidebar now displays (mostly) as intended, with each section / widget displaying in it’s own floating white box. Sidebar shows up on single (post) pages. Unfortunately, I think that’s it. But I *felt* productive! Make sure Sidebar doesn’t extend past/over footer. Next / previous hyperlinks on individual pages too close to header title. Better integrated “pages” functionality (in header?). Figure out how/if to have a different Sidebar (shorter, simpler?) for single post pages. I think that’s it, at least that’s all I can remember. If the blog doesn’t look or work much differently as far as you notice, that should mean I’m doing a good job. And if something’s broken, please tell me. I’ll fix it if I can.